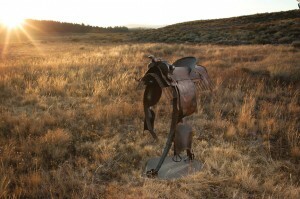 Bilde’s work evokes his Western home. Photo by Randy Etchison. In 1985, Blide followed one of his brothers, who was attending school in Chico, out west. Blide had already completed a three-year degree in mechanics and was looking for a job. A friend of his brother’s was working at Northstar-at-Tahoe (now Northstar California). From there, Blide worked at the Truckee Tahoe Airport for five years as a maintenance mechanic. When he and his brother started Blide Brothers Landscaping in 1998, Blide relocated down to Grass Valley, but he returned to Tahoe after a divorce and the decision to leave the business, moving to the small town of Calpine, just north of Truckee, four years ago. In the midst of other ventures, in the early 2000s, Blide started Wild Hair Welding as a hobby, creating sculptures out of mostly found materials. Just as he’d turn rocks into ladybugs as a child, Blide would search around railroad tracks and farmlands for “junk”—spikes, washers, gears, pipes and bolts—that he could turn into art. Because Blide did so much work at Riverside, he approached the four owners—Hughes, Mary Buchan Guerra, Kahlil Johnson and Sondrea Larsen—about becoming a partner. To celebrate his partnership, which became official on October 1, Blide created a giant diorama out of his Spike Men. His creations are BASE jumping, bungee jumping and performing rescues. He also created a train called The Truckee Flyer, made of ore mining wheels and a pressure tank, which is being driven and ridden by Spike Men. Riverside Studios is located at 10060 Donner Pass Road, Truckee, CA, 96161. Learn more at (530) 587-3789 or www.riversideartstudios.com. Alison Bender does most of her Christmas shopping at Riverside Studios (and usually ends up with a few gifts for herself as well).